Eleven undergraduate students who participated in ANGA Collegiate Energy Challenge during fall term have claimed first prize. 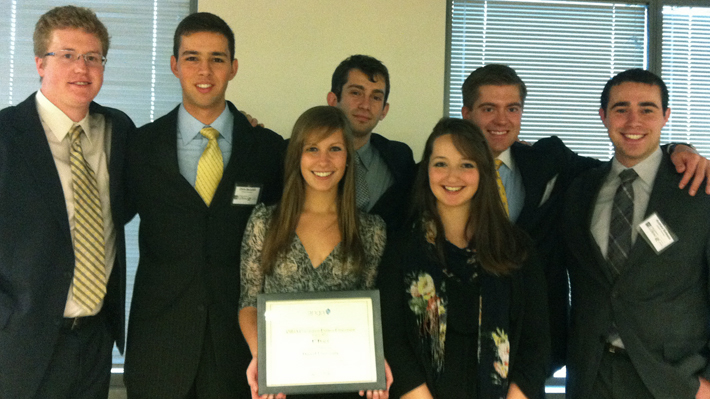 Utilizing a budget of $3,000, the students acted as consultants, developing and implementing a campaign to promote natural gas to the Drexel community. Working as a unified agency, the class divided into teams to tackle research, marketing and strategy implementation, and came up with the slogan “Pennsylvania Natural Gas: Fuel Today. Sustain Tomorrow.” The class traveled to Washington, D.C., in December to present its campaign to the judges. EdVenture Partners, an organization that builds industry-education partnerships, presented the competition alongside LeBow’s Dornsife Office for Experiential Education. The class’ winning presentation can be viewed at EdVenture Partners’ website. Dana D’Angelo, clinical professor of business, taught the class, and Andy Macaleer, adjunct instructor and a professional consultant, facilitated the program. The students who participated are: Andrew Lawson, Christopher Baccash, Daniel DiFrancesco, Jakob Metzger, Rita Bucca, Andrew Bellezza, Sarah Messenger, Diana Fox, Josh Robbins, Christina Russell and Jin Lee.